Oh, I had so many good intentions of staying organized, on task and enriched this summer. Didn’t you? And are you now like me, looking at the calendar and seeing that summer is coming to a close and you’re still in your PJs? It’s so easy to get out of routine in the summer time. And many times, that family routine of church, holidays and religious observances can get out of our habits as well. As the time for school approaches though, take heart! There is no better time, in my opinion, to start new traditions, get back into parish life, and dive into faith with your family–especially kids. Those same feelings of excitement can also transfer to church as Sunday school starts up again, and opportunities like acolyting or singing in the church choir come up in church schedules. 1. Get into Saint’s Days. Go through a calendar of feasts and holidays to decide in advance what days would be fun to celebrate as a family. There’s nothing like a special day to look forward to, even if it’s just a special meal together. For little ones you can print of coloring pages of a particular saint, look up interesting old fashioned traditions, dress up, or find an art project to work on after dinner. Some great feasts to celebrate this fall include Michaelmas on September 29, St. Francis Day on Oct. 4, and of course All Hallow’s Eve on Oct. 31 and All Saints Day on November 1. Talk with your kids about their concerns or big projects coming up or issues with peers and encourage them to seek guidance with prayer. Sometimes it seems so obvious, but it can be easy to forget. Praying with them or helping them remember that prayer can help them as they navigate through school can be a great chance for them to deepen their own faith. Include a program offered by your church in your list of extra-curricular activities. We often forget that our churches offer some amazing, and usually FREE, programs for our children that will not only develop them spiritually, but teach them a skill or nurture a talent. If you have child who is musically inclined, encourage them to join a choral or instrumental program at church. Help them foster leadership skills by taking part in an outreach ministry or an important program like the altar guild. These programs could also do double duty for older kids who need to log hours as a volunteer for an honor society or bolster their school transcript. Becoming an acolyte is also a fantastic way for kids to get involved in the very fabric of church life. 4. Put faith into family reading time. Whether it’s a special saint’s day, preparing for Advent, or exploring the role of God in their lives, encourage children to read about their faith. 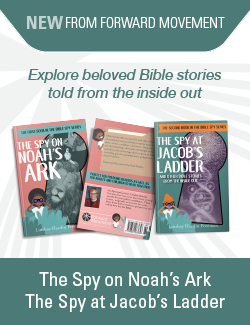 If you’ve got little ones in need of a bedtime story and snuggle, a simple picture book or section from a Children’s Bible will get their mind working and perhaps raise some questions they may have about God and church. Older kids might benefit from reading books about deepening their own personal faith, biography of saints, or ways they can navigate their growing up years. Simply make going to church on a weekly basis part of your family routine. With just about anything, doing an activity at the same place and time for an extended amount of time creates a habit, and it’s the same with going to church. The more you do it, the more it naturally feels like ‘what you do’ on a Sunday morning and there’s less resistance (most of the time!) from kids when they know what to expect about Sunday morning. These are a just a few of the ways that my family plans to rejuvenate our faith this autumn, and I hope these ideas are helpful to you as well. Remember, there’s never a time when you can’t do a total jumpstart to your life and routine, but something about autumn makes it feel so natural and exciting. We may not all be climbing onto the bus with our new lunch pail, but there’s definitely a feeling in the air of a fresh start. So take advantage of it, and enrich your family’s faith at the same time. 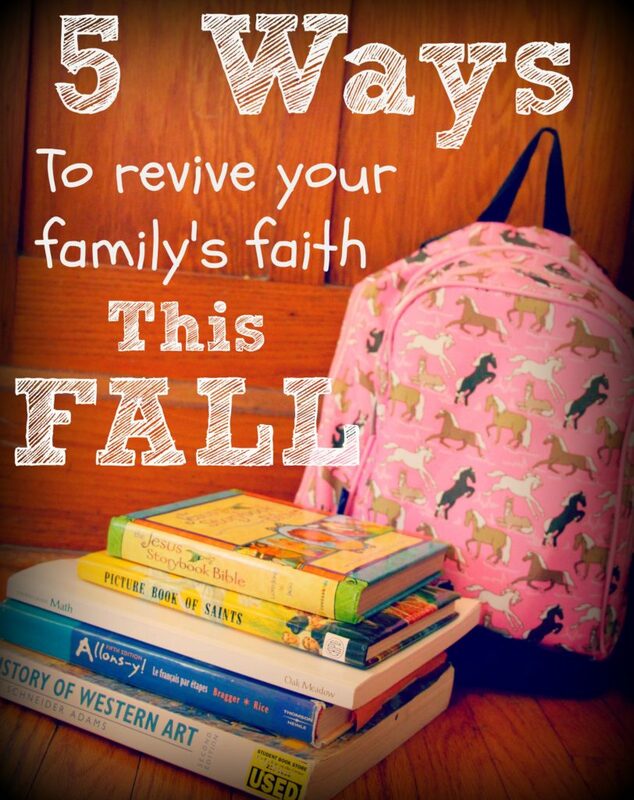 How might you revive your family’s faith this fall? Whether it is saying prayers before a meal and before bed, setting aside time every night to read about your faith, and making sure you go to church the same time every week, setting a routine is a good thing to do as once you do it is easy to stick to. Great information and tips, thanks for sharing!